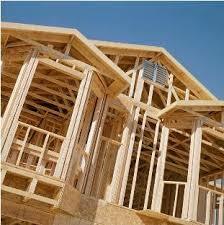 Writing a novel is similar to building a house. You start with a vision, a way that you want the thing to look and to feel – a sensation that you want to create. It only exists in your mind, but it becomes real long before it ever materializes on the screen or in a blueprint. As it begins to take shape and the foundation is set, the long creative process of building begins. Initially, it seems simple enough. You have a plan. You know exactly what you want. But then another idea comes to surface. You begin to think, Wouldn’t it be great if… And so it begins. A minor change here and a revision there. I suppose there are those who begin with a plan and stick to it. No extras. No variances for the course of action. But for those of us with a creative bent, that is simply not possible. Once that small idea takes hold, it worms its way into our soul, demanding expression. So we surrender and bump out that master bedroom wall or add another character. Its just a small thing, and we convince ourselves that the final result will be worth the extra hours spent. The writing deadline or the completion date for the house gets pushed out just a bit. The problem is, once that minor deviation is allowed and comes to fruition, you are so delighted with the result that your creative juices begin to run amok and you start thinking about a sun-room or a new story line. Soon, with all the changes, it looks as if you will never move into that house or finish that book. Such is the case with my current writing project – the Cooper Moon series. I am working on the final two books of the series and, unfortunately (or fortunately depending on how you look at it), a new story line crept its way into the books. Incorporating this story line means a lot of moving chapters and scenes around and is very time consuming. I did my best to ignore the idea for the new story line for as long as I could, but it kept rearing its lovely head. So, that means a lot of time for me spent moving scenes around on an Excel spreadsheet. 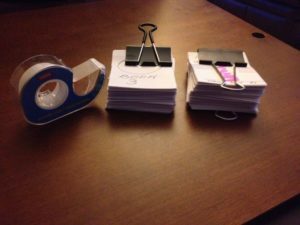 And when that didn’t work, it was back to writing the scenes down on index cards and sliding them around on the surface of a large table. Sleepless nights thinking of the best way to blend the story line in with the ongoing story. A few frustrated evenings trying to convince myself that I don’t need another story line. Really, I don’t. That much is true. But wouldn’t it be lovely to have a sun-room…. So, I’m floundering a bit – making notations, highlighting passages, cutting and pasting, and doing the research required to add this new story line. I don’t want to give too much away, but for you die-hard Cooper Moon fans, I will tell you that it involves the characters Drake and Ivy Miller. That is all I can say without giving it away. I know this will add depth to the series. I love the story line. But it is difficult and time consuming. As most good things are. Someday, when I look back on this, I will only remember the final result, not all of the torment that went into creating it. Just like building a house. The end result is always worth it. So, stay tuned readers. In the meantime, I will go back to moving scenes around and trying to get this sun-room…uh…series finished. And for those of you who have not grabbed your copy of the first book of the series – the ebook is currently FREE on Amazon, Barnes & Noble, Apple, and Kobo !!! Be sure to sign up for your Cooper Moon Book 3 Alert in the sidebar of this website so you will be notified as soon as book 3 is published!